Petersburg Community Club showed appreciation to several area residents at the annual Christmas Dinner and Show held Monday evening, Dec. 15. Despite the snow, ice and bitter winds, the total attendance was estimated at about 280 people. Several other awards were presented to area residents in appreciation for their service. 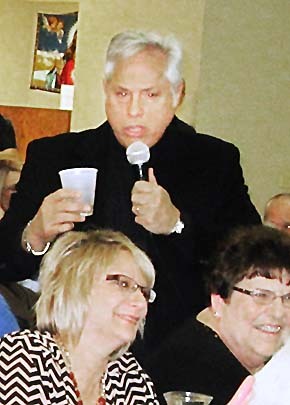 Above, comedian Willie Farrell involved his audience in the entertainment. Details in the Dec. 17 Petersburg Press Print and E-Editions.